You are here: Home / Bathrooms / Miracle Method Coming Soon to Fayetteville, North Carolina! Miracle Method Coming Soon to Fayetteville, North Carolina! 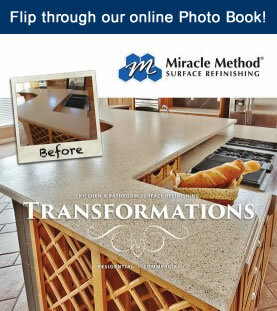 Miracle Method has an answer to the many Fayetteville homeowners who have visited www.miraclemethod.com looking for surface refinishing… we open for business July 29th in Fayetteville! Mark Ferguson, owner of Miracle Method’s newest office, will provide surface refinishing for bathtubs, tile, and countertops for homeowners, property managers, colleges, hospitals, and hotels. Mark’s office will be the fifth Miracle Method location in North Carolina. Miracle Method’s proprietary process is an excellent alternative to costly removal and replacement remodeling, often saving homeowners up to 75 percent over traditional replacement costs and making it an especially great value in today’s economy. 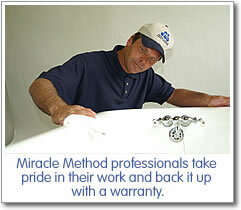 Refinishing work is backed up the Miracle Method’s worry-free warranty. Learn more and request a free estimate by visiting MiracleMethod.com/fayetteville or call Mark Ferguson at 910-672-6824.